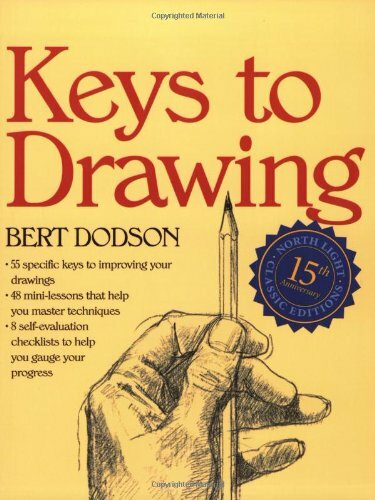 Here's a pretty good book for anyone who's thinking of picking up drawing. Bert Dodson has written it in a crisp straightforward manner. The are 55 keys of drawing, introduced at a very comfortable pace. Alongside are 48 easy-to-follow lessons. The examples are all sketches from Bert Dodson, his students and selected pieces old art masters. They are all pretty sketchy but this book isn't about techniques on realistic drawings. It's also not about specific technical rendering techniques, although some are briefly introduced. This book is really about the approach to drawing, which aims at helping students tackle any subjects confidently. The principles are very similar to The New Drawing on the Right Side of the Brain. I prefer this book as the lessons are shorter but effective, and the book can be picked up at anytime after reading for some inspiration. Highly recommended book for beginner artists.